TELL US WHAT YOU PAY! WE WILL BEAT IT! The new garment from DuPont, based on the barrier performance of Tyvek®, that uses proprietary technology to combine durable protection against oil and pressurised jets of liquids with fabric breathability - the first in the Type 3 (liquid tight) garment category. Colour: white. Made from DuPont™ Tyvek® laminated with a chemical-resistant film, presents wearers with an optimum barrier against a range of chemical environments and hazards while also being supple and lightweight. Labo is a overall especially designed for use in laboratories and in the pharmaceutical industry. Tyvek Labo acts as a barrier that protects both the wearer from chemical threats and the process from contamination by the wearer. Provides an even greater barrier against aggressive chemicals, toxic substances, gases and most organic chemicals. 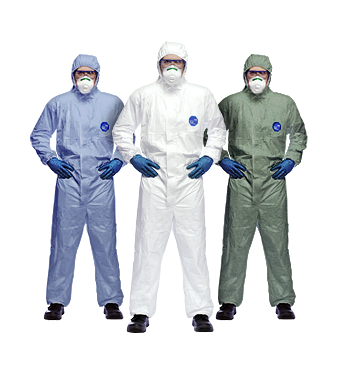 Manufactured to meet the seam-tightness requirements and whole-suit tests defined by the new European standards for Chemical Protective Clothing of Types 3 and 4. The combination of the film and the polymer provide a particle-tight material with good resistance to penetration and permeation by many liquids and gases. Flexible and lightweight yet strong. Stitched and taped seams. 100% protection against hazardous dust and powders. Anti-statically treated. New more open polyethylene structured fabric than Tyvek, offering protection, durability and comfort. Elasticated stitched in waist. Elasticated hood, cuffs and ankles. Nylon zip.